Close, who received an honorary degree from William & Mary in 1989, will be awarded an honorary fellowship, the highest honor that a college of Royal Charter can confer, at the ceremony. Philanthropist Jane Batten HON ’17, world-renowned opera singer Denyce Graves and pioneering women’s rights attorney Sybil Shainwald ’48 will receive honorary degrees at the ceremony. W&M Chancellor Robert M. Gates ’65, L.H.D. ’98 will speak at the event along with W&M President Katherine A. Rowe, who will be presiding over her first Commencement at the university. In addition to celebrating the university’s Class of 2019 graduates, the Commencement ceremony will serve as the culmination of William & Mary’s yearlong commemoration of 100 years of coeducation. Close will become just the third person to receive an honorary fellowship from the university. English institutions of royal founding such as Oxford and Cambridge have customarily bestowed fellowships. Charles, Prince of Wales, was the first person to receive such a fellowship from William & Mary. The university presented it to him during his visit to campus in 1981. Princess Margriet of the Netherlands received an honorary fellowship in 1989 as part of the celebration of the 300th anniversary of the accession of King William III and Queen Mary II. Close is an acclaimed actress who has appeared on stage and screen in multiple award-winning roles. 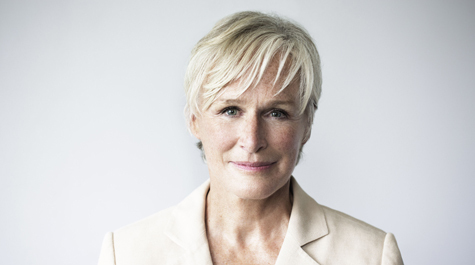 Among her many accolades are three Tony Awards, three Emmy Awards, three Golden Globe Awards and two SAG Awards — including one most recently for her role in the film “The Wife.” She was also nominated for an Academy Award for that performance, bringing her Oscar nominations to a total of seven. In 2013, Close received William & Mary’s Cheek Medal for her contributions to the arts, and she visited the campus to participate in several events, including the university’s second annual Arts & Entertainment Festival. Pulling from her personal collection, Close lent the Muscarelle Museum of Art costumes from many of her iconic TV and film roles for an exhibition. Swem Library also hosted an exhibition about her ties to the university, featuring notebooks, letters from classmates, posters, programs, photos and some of Close’s personal papers. Close narrated the short film “Her Story,” which premiered during William & Mary’s first Women’s Weekend, held in the fall of 2018 in conjunction with the 100 years of coeducation commemoration. The film was part of a series of videos about women at the university. In addition to performing, Close is an advocate for wildlife conservation and mental health. In 2010, Close co-founded Bring Change to Mind, a charity dedicated to erasing the stigma and discrimination around mental illness by empowering people to start the conversation. Co-founded with her sister, who lives with bipolar disorder, BC2M is now in its 10th year and has become a force in the world of mental health advocacy. Close went to Washington, D.C., in support of the passage of the Excellence in Mental Health Act, which was signed into law by former President Barack Obama. Close actively supports Puppies Behind Bars, which trains inmates to raise service dogs for wounded veterans and first responders. She is a founding member and current co-chair of the Conservation Council for Panthera, an international nonprofit whose mission is the conservation of the world’s 36 species of wild cats. She is a trustee emeritus of The Sundance Institute, having served as a board member for 16 years. For more on this story visit W&M News. In a recent W&M Alumni Magazine article, Close discusses why she decided to lend her voice to "Her Story."